Increase visualization and expand your view by displaying individual applications on their own monitor or span large applications across several monitors through a single terminal. ThinManager provides several features for delivering content in a customizable format. MultiMonitor allows to display up to five monitors on a single thin client*. 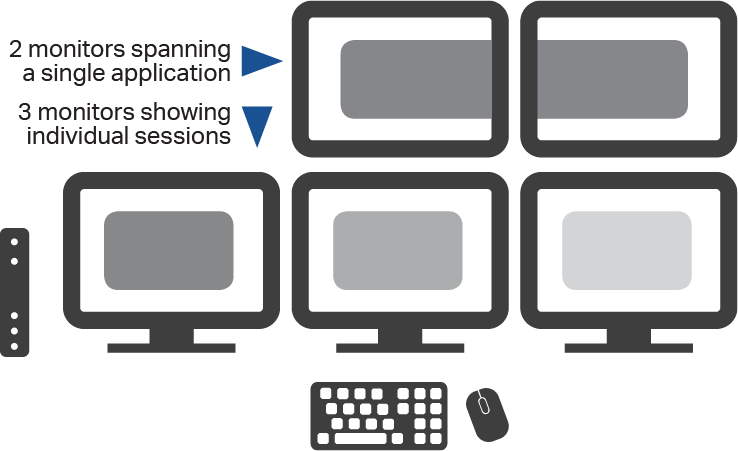 MultiMonitor can be used to span sessions across monitors and/or run individual or multiple sessions on each monitor. Touchscreens are also supported. MultiMonitor supports spanned resolutions up to 8192 x 8192 with 64K colors for MS Server 2012 and newer. MS Server 2008 and prior are limited to a spanned resolution of 4096 x 2048.